Looking for a cheap flight from Prague to Budapest (PRG-BUD)? Before you book a flight you can use Utiket to find the cheapest flights from Prague to Budapest for Czech Airlines, Wizz Air, Travel Service. All flight data are real-time and accurate. Utiket finds all the cheapest flights from Prague to Budapest. On average the flight time between Prague and Budapest is about 1 hr 10 min. There is no time difference between these cities. The timezone for both cities is: UTC +02:00. The local time now: 04:57:13. The Václav Havel Airport Prague, previously Prague Ruzyne Airport, is the international airport of Prague, located about 20 km northwest of the city. It is the busiest of the former East-European communist countries. The Prague Airport is the main base for Czech Airlines and a hub for low cost carriers Wizz Air and Ryanair. The airport was a major scene in the 1968 Soviet led occupation of Czechoslovakia to end the Prague Spring. The airport was captured in the early hours of the invasion. A special flight from Moscow carried more than 100 agents who quickly secured the airport and prepared the way for the airlift which carried Soviet troops and tanks to Prague Airport. 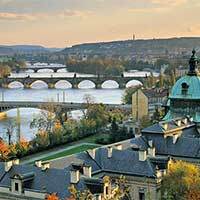 Find cheap flights to Prague or read more about Václav Havel Airport Prague. The Budapest Ferenc Liszt International Airport, formerly Budapest Ferihegy Airport and still known as Ferihegy, is the largest of the four commercial airports in Hungary serving the capital Budapest. The airport was renamed after Hungarian composer Franz Liszt in 2011. Liszt Ferenc International Airport is with less than 10 million passengers a year fairly small for a capital airport. 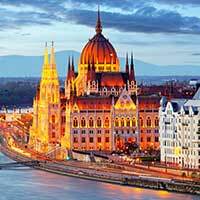 Find cheap flights to Budapest or read more about Budapest Ferenc Liszt International Airport. Which airlines have direct flights between Prague - Budapest? Need place to stay in Budapest?